50 watt halogen lights (3) (+$295.00)	 ? Canvas Carrying Bag with handles (+$98.00)	 ? Hard Case with Wheels (+$289.00)	 ? Moderate Artwork Setup for Hop-up (+$45.00)	 ? 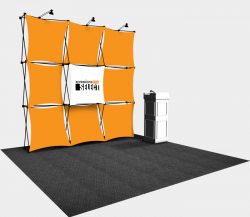 This booth is wildly popular with trade show and special event industry designers. Custom frame and graphic combinations are too numerous to catalog, so we’ve made it simple! The creators of the original Xpressions® have packaged, in complete kit form, our most popular Xpressions®SNAP!™ displays.